Fire blight is a common disease caused by a bacteria that primarily affects ornamental fruit trees. Pear, quince, apple, crabapple, and firethorns are some of the most susceptible to fire blight; hawthorn, juneberry, serviceberry, mountain ash, and other related plants are less common but can still fall victim to fire blight. Most pear tree varieties including Asian pears and red pears are highly susceptible to this disease. Bradford, Capitol, and Red Spire pears are less susceptible but still at risk. Aristocrat apples are highly susceptible to fire blight; Fuji, Gala, Golden Delicious, Granny Smith, and others are also susceptible. Fire blight is named for the burned look of leaves on infected trees as it destroys fruit, leaves, and branches and can even kill susceptible trees. Fire blight starts with abscesses that form on tree trunks and branches that ooze a watery, light-tan bacterial liquid. This liquid turns dark after exposure to air and can leave long, dark streaks. These lesions are usually small and very easy to miss on inspection. 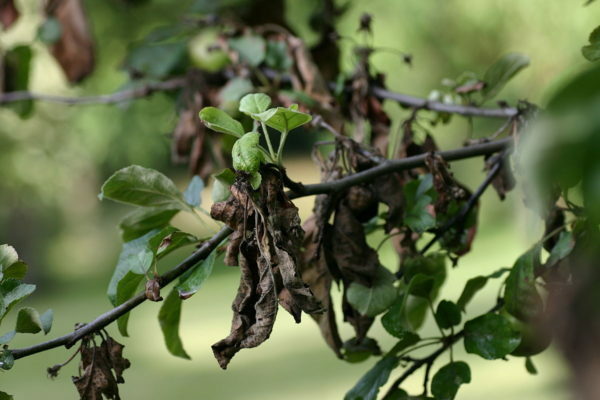 As the disease progresses, leaves begin to shrivel, dieback, and turn black. Once the disease spreads to the wood, the wood beneath the bark will leave reddish streaks. If left untreated, the disease will eventually spread to the root system. Fire blight is driven by seasonal weather. Warmer temperatures (75 to 85 degrees Fahrenheit) combined with intermittent rain bringing moisture create the ideal conditions for fire blight to thrive. Fire blight enters the tree through new growth (flowers and flower stems) and makes its way up the branch, into the trunk, and then the roots. Infected sections of the tree should be removed immediately. Pruning shears should be dipped in a 10% solution of bleach and water to help prevent the spread of disease. It is important to cut far enough below the lesions to remove them all – generally about 12 inches below the lowest point of disease tissue. Because the new growth tissue of fruit trees are very susceptible to this disease, fertilizer application and pruning should be avoided if possible as this promotes new growth, providing ample opportunity for the blight to spread. Irrigation should be avoided during blooming season. Monitor fruit trees regularly and remove and destroy any infections that appear. If possible, try to avoid planting varieties of fruit trees that are most susceptible to the disease. Copper products can be used to prevent fire blight but they often don’t provide adequate control against the disease. The copper spray must be applied to open blossoms so the number of applications needed depends on the length of the blooming period. Once the blooms open, apply the first round of spray when the average temperature exceeds 60 degrees. Applications should then continue on a 4 to 5 day interval during periods of high humidity and until the late bloom is over. Caution should be used as copper products can cause scarring of the fruit. Ornamental fruit trees can be a focal point of your property’s landscape design. If fire blight or other tree diseases are a concern, contact your Account Manager for more information, remediation options, and/or planting recommendations.